But all too often, users need administrative rights for routine tasks like installing/updating programs and changing operating system settings. UAC prompts on every administrative task usually leads to poor user experience. The more an user is prompted, the more likely it is that he or she will dismiss the prompt without reading it. The net effect is that many annoyed users have disabled the UAC in response to the annoying UAC prompts. With UAC disabled, IE’s protected mode is also gone. Under protected mode, IE runs in a sandbox, restricting write access to most part of the system. Thus, from a security standpoint, it is useful to leave UAC enabled. 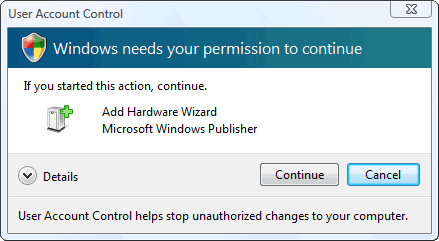 The Norton Labs User Account Control is an alternative to the default Windows Vista UAC system. The tool has a “remember” feature that suppress future prompts for the same action. The goal of the tool is to build a whitelist and blacklist database on various actions, thus reducing on the number of unnecessary prompts. Do note that Norton Labs UAC sends meta information to their servers whenever a prompt is displayed. Norton Labs uses this information to build the whitelist database.